Badrinath Dham Yatra 2014 Opening Date & details, Uttarakhand Tours: -Shri Badrinath Dham Yatra is one of the famous and holy tours in Uttarakhand as well as India. Every year so many tourists and visitors are came to visit the Shri Badrinath Ji Temple. Badrinath is a very holy and scared place in Uttarakhand. It is one of the Dham in Four Dham of India. 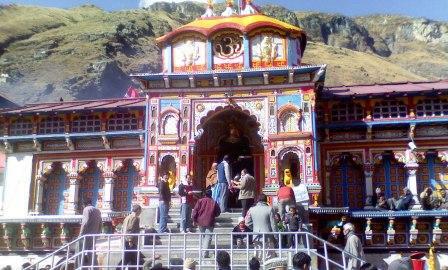 Shri Badrinath Ji Temple is situated in the Chamoli Garhwal District of Uttarakhand State. And it is well connected by Roads transports from other major cities. Every Year the Badrinath Ji is open between Aprils to May month and close till Nov month. So we can say that the temple is opens for six month in every year. Shri Badrinath Dham is a temple of Lord Vishnu (Hindu Religion God). And it is very holy place for Hindu. Many tourists from abroad are also came to visit the Badrinath Ji Temple. Let me come to the main point about the “Shri Badrinath Dham Yatra (Tour) 2014 Opening date”. So the Badrinath Dham will be opens on 5th May 2014. And the tour is started from 5th May 2014. On 5th May 2014 after Pooja in the Temple, it will be opens for tourist and visitors. You might also like: - Shri Badrinath Dham History, details and tour guide. You may also contact us via email (onlineuttarakhand@gmail.com) for more details and Badrinath tour booking 2014.